Sea ice decline is “one of the most visible impacts we see as a result of climate change"
Arctic sea ice peaked early this winter, and at its lowest maximum since record keeping began in 1979 -- yet another sign that global warming is already wreaking havoc on the planet. The National Snow and Ice Data Center reports that on February 25, the ice reached a likely maximum of 5.61 million square miles, which is 425,000 square miles below the 1981-2010 average. It's also 50,200 square miles below the previous record, set back in 2011. The decline in sea ice is “one of the most visible impacts we see as a result of climate change,” Margaret Williams, managing director of the WWF’s Arctic program, told Salon last year. The Arctic is heating up at about twice the rate of lower latitudes. And it's the victim of a vicious feedback loop: when there's less ice to reflect it, the sun's rays are instead absorbed into the dark abyss of the ocean, leading to even more warming and even more ice melt. 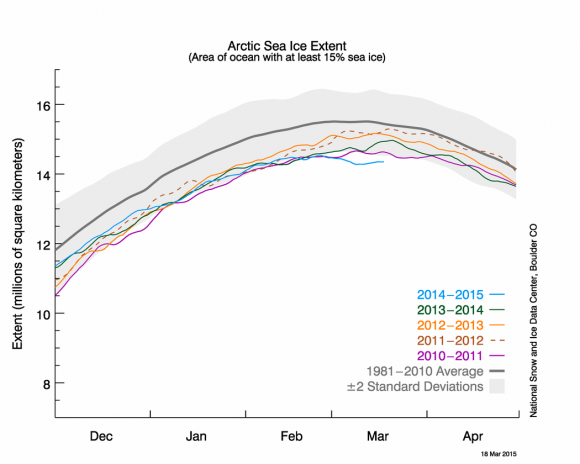 This is bad news for the walruses, and the entire network of life that depends on the sea ice. It's bad news for the whole Arctic climate system -- with potential implications for extreme weather events throughout the world. And it's more "proof," if you need it, that the consequences of our fossil fuel addiction are already playing out.